Eubrontes fossil dinosaur track at Dinosaur State Park in Connecticut; photo by Ken Zirkel on Flickr (noncommercial use permitted with attribution). 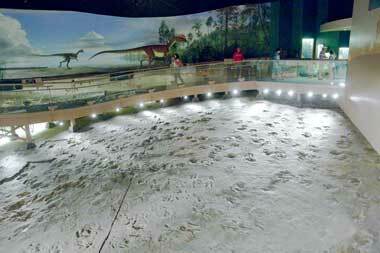 This dinosaur track was imprinted 200 million years ago during the early Jurassic period. 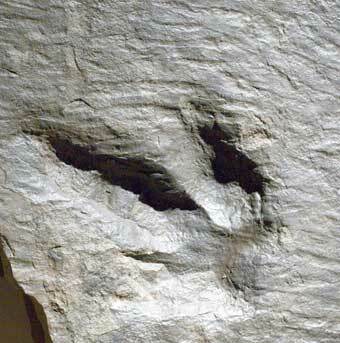 The sandstone of the Connecticut Valley is the world's foremost dinosaur track location, attracting visitors from across the globe. Fossil eubrontes dinosaur tracks at Dinosaur State Park, Connecticut; photo by Ken Zirkel on Flickr (noncommercial use permitted with attribution).